Los Lobos members Cesar Rosas and Conrad Lozano, back, perform with Bulldog Mariachi and Folklorico from Tucson’s White Elementary School. As production progresses on the documentary The Mariachi Miracle, producer/director Daniel Buckley filmed a very special musical encounter. 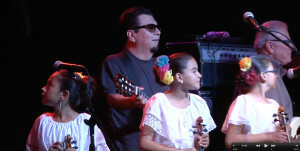 While Los Lobos was playing at the Rialto Theatre, April 24, 2014 as part of its 40th anniversary tour, the group invited Tucson’s Bulldog Mariachi and Folklorico from White Elementary School to open for them, then played a number with the youngsters and invited them back to sing “Volver, Volver” song as part of its own set. Backstage after the concert group members Louie Perez and David Hidalgo talked with Buckley about the collaboration, as well as the impact of youth mariachis across the United States. ~ by Daniel Buckley on May 16, 2014.